I haven’t post for a while, however I’ve been reading the forum a bit(now got new user name, forgot old). I’m here because I’m experiencing some problems with my scalp. 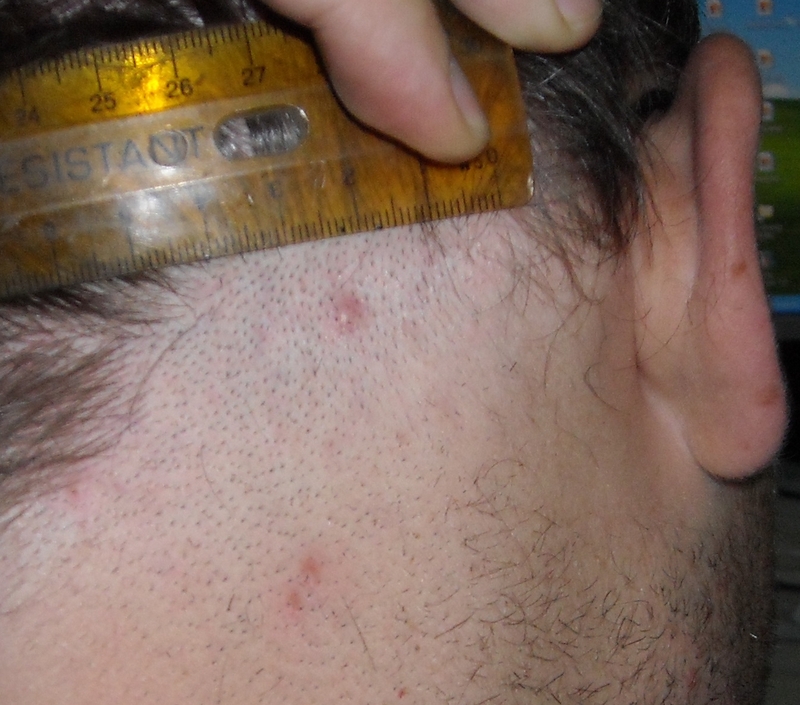 this photos were taken on my neck were I found one of these spots quite close to the end of the hair zone. So, what I did was to buzz a little area to expose the problem. The problem with this is that besides being painful and itching, they prevent me from applying minoxidil because they also appear on top of the head(and everywhere). Well, I don’t know what they are neither how to get rid of them. The inflammation gets worst when I eat greasy food or when I go to te gym(bigger spots appear, and they bleed). Dermatologists usually give me a shampoo and send me back home, any thoughts? Joaquin, How old are you? when did your hairloss start? Do you have facial acne? 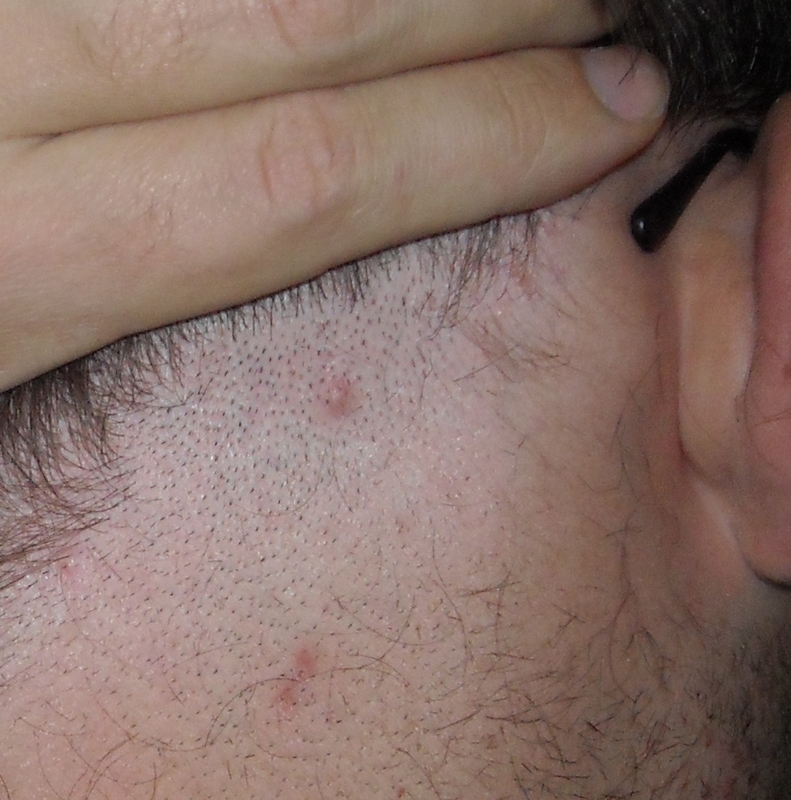 I started getting these exact things (looks like acne to me) around the time my hairloss started. I still remember when combing my hair, I would sometimes accidently touch one of these spots with the edge of the comb and it would hurt like hell. Now I’m NW6 and these spots/acne are still on my head - which looks horrible. Btw, I’ve tried everything that I could think of Nizoral, Head & Shoulders, Selsun Blue, Johnson baby shampoo, Tea Tree Oil, Lavender Oil and god knows what. If someone knows anyway of treating these please do let us know! It does look like some typical scalp acne, like the other poster said. I’m 26. I began losing hair about 6 or seven years ago. I may have some facial acne, but very very little, most of it related to shaving I think. When acne appears in other parts of my face, it appears like very tiny spots that quickly heal, with no inflammation or bleeding. They’re definitely not a problem. The ones of the scalp are really much serious, they’re bigger(much bigger than in the pic) and they bleed. And it also takes longer for them to dissappear. » it would hurt like hell. » and god knows what. I think that the solution may come from a non topical. I tried ketoconazol oral and topical steroids. The problem is that they appear whenever they want, so it is really difficult to tell if a medication is working or not. » If someone knows anyway of treating these please do let us know! I will visit a dermatologist(again!) this week, but this time I will bring the pics with me. Perhaps some antibiotics can help, I don’t know. I’ll keep you guys posted, Joaquín. I have those too, they pop up once very so often when I am not eating right (lots of fried food and sweets etc), I think they are just scalp acne, I pretty much ignore them most of the them. Your derm will probably prescribe you antibiotic to prevent infection. » you antibiotic to prevent infection. I get these as well. They can be quite painful, and seem to show up when I’ve been sweating heavily (but it only started to occur when I started losing my hair). I think its a form of acne, but it would be interesting to hear what your dermatologist has to say. yes sweating causes this on me too. More exactly, when I eat fried food or sweet I begin to feel that my scalp sweats and a little itching and then these spots appear(most of the times immediately, yes in a few minutes!). I’ll post whatever the doctor says. » » you antibiotic to prevent infection. » to hear what your dermatologist has to say. » these spots appear(most of the times immediately, yes in a few minutes!). » I’ll post whatever the doctor says. » Have a nice week! » » » you antibiotic to prevent infection. » » to hear what your dermatologist has to say. Piroctone Olamine shampoo should help you with this condition. My totally unscientific hypothesis is that, when we had more hair, the hair helped soak-up the sweat, keeping our scalp relatively dry. Now that we have less hair, the sweat is sitting on the scalp, mixing with the oils of our hair, and clogging the pores on our head. The result is acne. I’m here again posting some news Well, I finally got an appointment with a dermatologist. I brought the pictures of my scalp with me, and showed them to her(she was a woman, BTW:really nice) . She told me that it is acne and has nothing to do with food. IMO, it is not greasy food what triggers these spots, but it makes them get worse. Well, her explanation was that they appear with stress. She prescribed me topic and oral antibiotics. I can look for the names of the drugs if there is anybody interested. I still haven’t seen any results from this treatment as I’ve been only two days on it, but I’ll keep you guys posted . Thanks again and good luck for everybody out there!! » showed them to her(she was a woman, BTW:really nice) . » not greasy food what triggers these spots, but it makes them get worse. » Well, her explanation was that they appear with stress. » the drugs if there is anybody interested. Which antibiotics did she prescribe? Btw, what else did she say about the scalp acne, anything interesting? » Thanks again and good luck for everybody out there!! Thanks for the update. I would like to know why scalp acne seems to prevelant among those losing hair. I have never had a real problem with acne, and had never had any on my scalp, but once my hair started thinning, I did begin to experience it. the oral antibiotics are limeciclina(in spanish). Perhaps it is useful the name of the commercial product to tell the name of the drug. It is Tetralysal 300 from Galderma(made in France). I will be about a month on them taking one per day. She also prescribed topical antibiotics “eritromicine 2%” to apply on the spots. I applied it on the scalp and the overall result was good, less itching in general . And less hair loss detected on the shower. Perhaps the most interesting thing she said is that this condition is not related with food. I’m eating normally now and I’m ok. I think that I will try the topical on other areas where I normally get acne as it is indicated for that condition too. Azelaic Acid - has done the trick for me. 5-6 and ALL my acne is gone. PERSONALLY for me it has done more than anything else to slow my hair loss. I am convinced for SOME (not all) that the hormones causing acne CAN be related to hair loss - I mean they are all androgens. Anyway, I use 3-5 different things to combat hairloss - and Azelaic Acid (skinoren is the product name) has done the most for me. This might help. Buy a bottle of Milk of Magnesia and spread a light film on the scalp or troubled area. Leave on overnight initially for the first couple of weeks. Then it might not be needed as often or as long. My experience has been that this makes for a very healthy scalp and greatly reduces or eliminates any irritation. It doesn’t make hairs grow but sure makes the scalp feel healthy and normal. Very good for oily scalp. For more information about milk of magnesia and it’s uses for skin problems: search Joe and Teresa Graedon, they have a website called; People’s Pharmacy. Not sure if I have the answer but when I’ve got something microbial, I use collodial silver and it handles it. they use it in the hospitals for cleaning burn victims because it’s gentle but also strong. Don’t know what you have there and I’m not doctor. You could give it a try. I’m using something very soothing on my scalp which has a healing effect, it’s helping with hair growth big time and totally calmed my scalp irritations. you could check that out too? naturalcrown. » problems with my scalp. » to expose the problem. » gym(bigger spots appear, and they bleed). » Azelaic Acid - has done the trick for me. 5-6 and ALL my acne is gone. » PERSONALLY for me it has done more than anything else to slow my hair loss. » product name) has done the most for me. Did you also have Scalp acne? and skinoren took care of it completely and also stopped your hairloss? do you use it on a continual basis or stopped using once acne was cleared?